After “harmlessly” throwing in a couple monochrome icons from my personal projects, I found myself reading a few of the icon requests and one thing lead to another… Now I’ve pushed in somewhere around 25 new icons, mostly towards apps with the goal of filling in gaps of common applications. These new icons will hopefully bring a much more cohesive launcher menu, with more core and popular applications having Breezy icons. Some of these may be shunted to an extended repo; 3rd parties get antsy when they see their logos get “breezified”, so “branded” icons need to occasionally be separated from the main repository to avoid troubles and takedown requests. Lastly but not least; Uri and Andreas have been nothing short of awesome in helping me get these out, thanks guys! The tale of an annoying, terrible, awful wallpaper, and How I Made it. I’d like to say that I’m less a man and more a force of nature – one able to sweep my hand and make art bloom at will… But this would be a lie, and occasionally getting art out there makes the only force I can muster feel like a fart in the wind. The new wallpaper for 5.4 just did not want to be made, and took days on and off trying to figure out what to do. I nearly just suggested we ship a backup wallpaper I had on the sidelines. 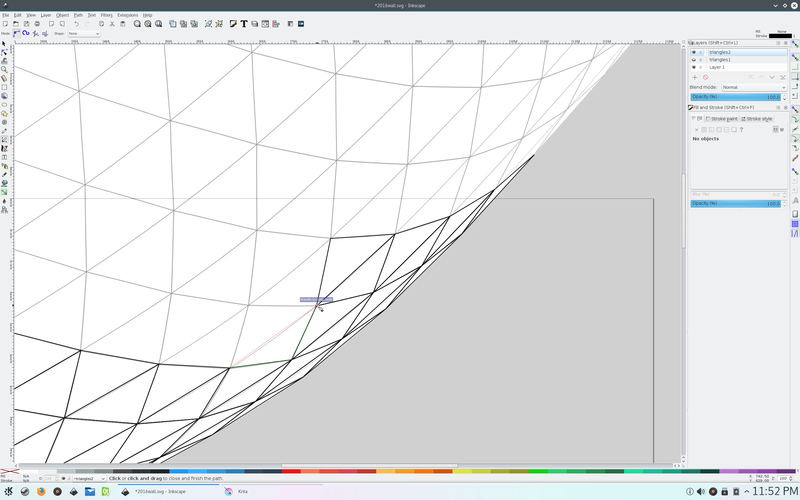 It’s how I’ve started every wallpaper, by simply drawing a triangle grid in Inkscape. This time around I also halved the height of successive rows near the top to give it a ‘curving away’ effect. 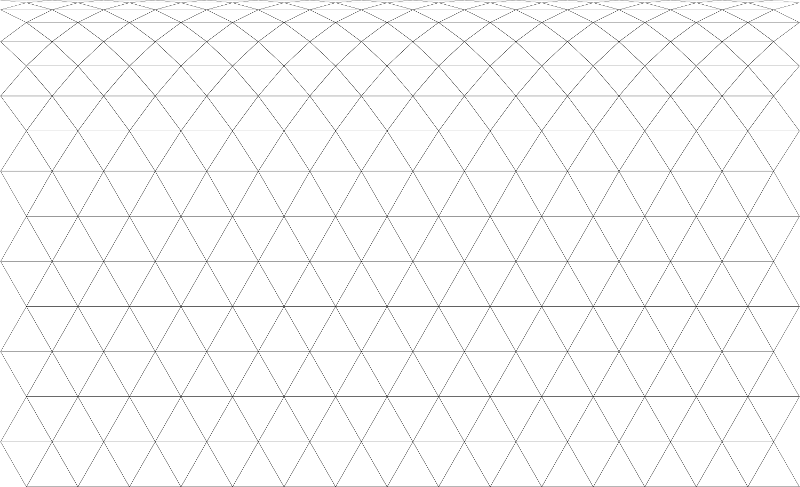 I them exported this grid as a PNG with the intent to curve the grid. Originally, I tried to do this step in GIMP, and I need to say I was very disappointed. I don’t know why, but the GIMP cage transform tool is utter and terrible crap. Sorry guys but… Seriously? Anyway, I looked up how Krita could handle it, and again and again Krita impresses me; not only did Krita have amazing transform options, but they were all extremely fast. 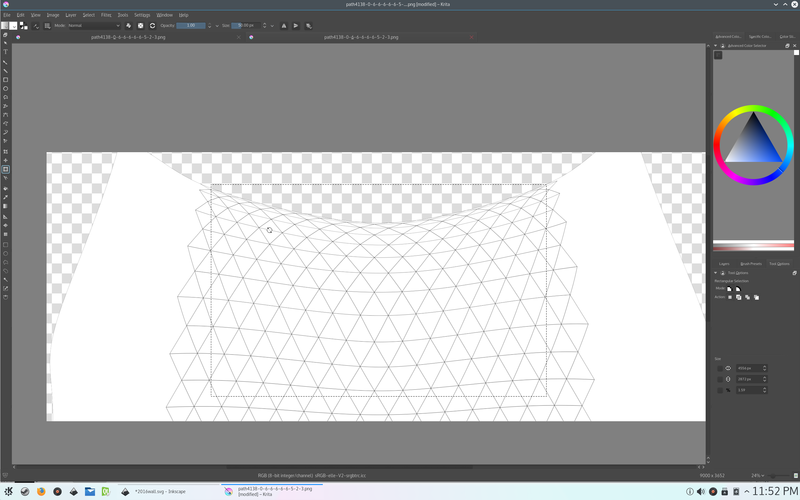 I swapped out to the Warp transform tool, and curved the grid twice; one bowing in and another bulging out, which I imported back into Inkscape. Above you can see me tracing the new curved grid. I set up snapping so each triangle would snap perfectly into place. Each triangle had to be drawn individually because they are all slightly different due to the curve. After tracing, I gave each half a base colour. At this point, I fiddled a with several colour combinations and patterns. 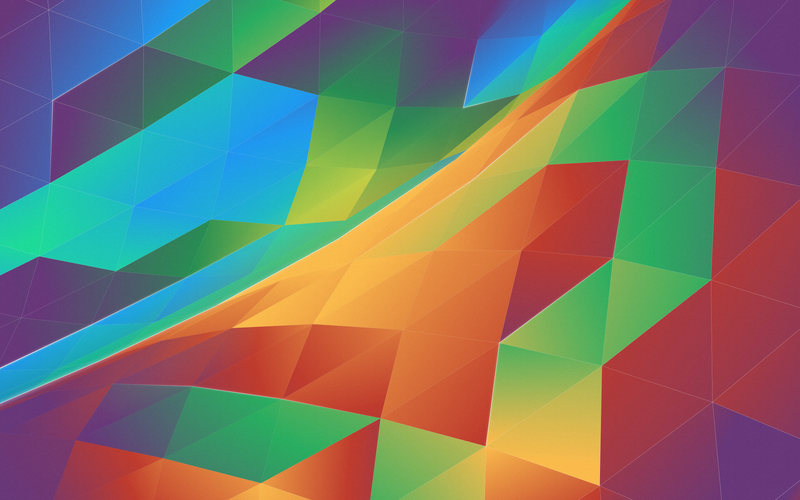 Because I’m an idiot, this meant I adjusted each triangles gradient vector individually; though I did configure Inkscape to manipulate all gradients at once. I took a break from endlessly tweaking colours, and I cropped the excess from around the canvas. Eventually I decided that each side would need two palettes, and how I would lay out the colours to get a nice effect. The 4 gradients that I would use would have a light and dark end. All the dark ends would terminate in the same purple so I could blend the gradients near the edges. I would also “twist” the gradients in a way that would break uniformity a bit without looking noisy. I’d like to say I got the ratios of all the stuff I’d done right the first time, but it took some tweaking until I was happy that the gradients were consistent with the “rules” I made. I also stuck with the Breeze colour palette again. … So after an annoying, terrible, awful run of bad wallpapers I now need to toot my own horn and say I’m pleased with this final result. I’m also satisfied with the break-away from “flat grids”. The new wallpaper and icons will be available in 5.4. I’d also like to thank the VDG, everyone is doing great stuff. Additionally, if you are attending Akademy I recommend to the utmost that you attend the various VDG events; we’re interested in roping developers to help out, and any coders will be appreciated. Great UI/UX is more than pretty pictures, and we’d love for developers to contribute so we make the entire package together! Realente me gustaria saber en que linux la apariencia es asi, donde se ve que esta trabajando en inkscape. I thought those drugs are no longer available since the 70s. Feels like a revival of the first LSD experiments. Mix Forms and Colors, mix them again, and then aeh swirl them, maybe another round for a mix: got it. Luckily e.g. Fedora provides a blue simple and clean version of that color experiment which eases my eyes. This looks awesome! Thanks for designing the awesome artwork of KDE 5! Wanderful Hot to get the same blur effect on the main desktop wallpaper!? The blur is fantastic! Sure, changing is easy. That’s not the point. Why waste precious space for such an abomination of a wallpaper in the first place!? end up with the wallpaper craziness. It’s the default and that is what seemingly emerges everywhere. that’s what I am complaining about. Why not have a saner choice? Konqi as the current mascot for example. The adorable logo makes much more sense. Just a suggestion. Or keep it one-colored. How about the projects that has build own identity in years? 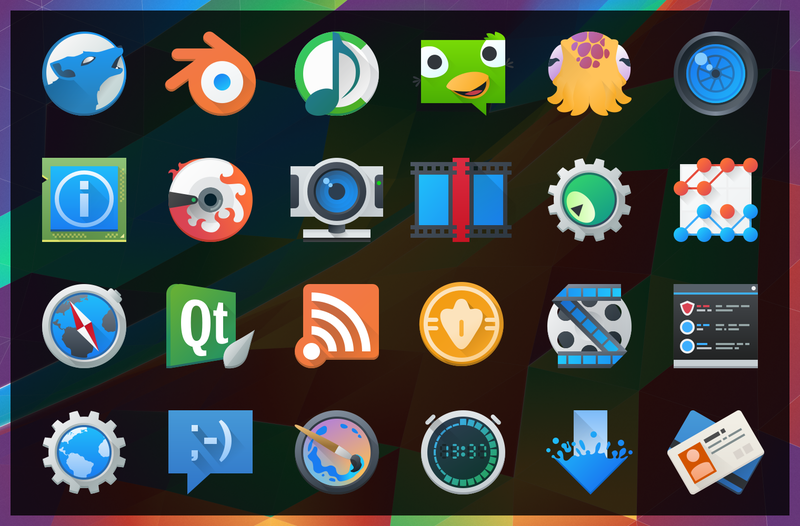 Should they just change their icon, branding etc just because KDE feels so? I absolutely love the new icons and the walpapers. I like all the nice colors in it. Maybe there are a bit to many cold colors in there for my taste but that’s just a minor discrepany with my taste. But all else the composition and all is just fantastic. In fact the only thing that realy bothers me with the new Breeze artwork is that the widget style is too flat and that the monocrome icons on the toolbars and menus don’t have enough visibility (contrast) when using the Dark Breeze theme. Is it possible to fix this so that monocrome icons look good in both dark and normal Breeze color schemes/themes? All else is just perfect. Keep up the great work. There’s been a tonne of discussion about Breeze and dark themes in the VDG, and we’re trying to figure out if there’s any better way to cope with the varying colour rollouts. There is a Breeze Dark theme which I don’t use myself, so I can’t say how good it is as a daily driver on dark themes. I’ve brought it up a couple times myself in our conversations because on a per-application basis some programs can change their colours individually – which causes additional problems. This is a thing on our radar, and we’re banging our heads now and then to see if any ideas rattle out. Icons look amazing, more of them pretty please. Wallpaper, sorry is psychedelic and absolutely horrible. please stop and try a more sane approach. Wallpaper is not appealing and has to die. You know you can change them, right? I’d really prefer not to read non-constructive comments like this on the posts of doers and makers. Myself, I like these colourful backgrounds as the login screen wallpaper, but will rotate the actual desktop background with some random collections. I suggest you do the same, and perhaps contribute some wallpapers to KDE yourself? One more thing — it’d be great if the old Plasma 5.x wallpapers could be included in the installations. I just can’t find the older full-res versions anywhere. Here’s a constructive comment: please use less colors and make them ‘soft’ or in other words ‘easy on the eyes’. This wp reminds me of the scene In the ‘fear and loathing in Las Vegas’ when the guy was attacked by the colors/shapes from the carpet. I (think) it was Thomas who observed the demand for the successive iterations be included for people who like the older wallpapers. Don’t know if it will happen, whether it would be packaged standard, or if it would be in the extended wallpapers package – but we know some people have gotten attached to the older wallpapers, and no matter how often I share that link, people have gotten frustrated when the new wallpapers roll in and there’s no obvious way to get it back. It’s a great work , but we need more please 🙂 . great stuff dude congrats 😉 are you coming to aKademy? Beautiful work! I have to say that Plasma 5 is hands down the best looking Linux desktop today. I’m currently with 5.3.1, and I even switched to Kubuntu (both home and at work!) to get to use this beauty as soon as possible. I’m just impressed each and every day. Lots of thanks to everyone who made this happen! I’ll be frank and honest here. 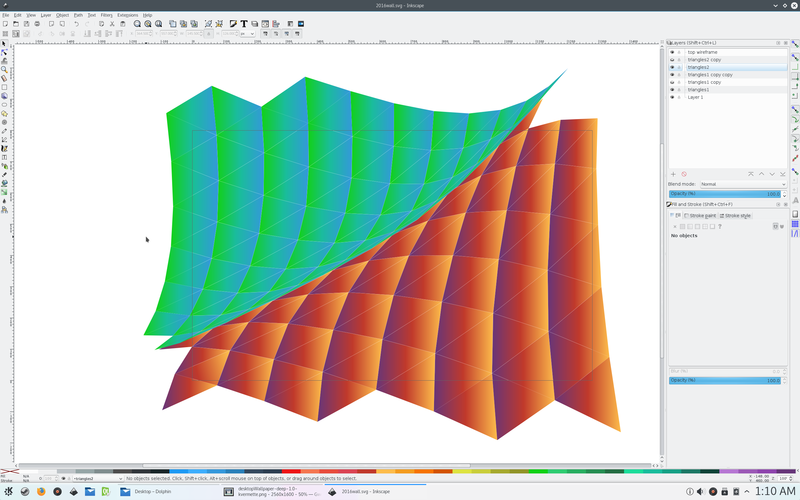 I’ve taken a look at the new KDE 5 software and as of yet, I’m unimpressed with the way it’s functioning. As to the graphics you are using for both wallpaper and icons. Here’s my take on it. The icons I personally look forward to as most of the icons I’ve seen are NOT aesthetically pleasing. The wallpaper is entirely a different story. Though you explain how you came about it here and I do not doubt your talent, I think it’s utterly ugly. Like many, the wallpaper is one of the very first things I switch out. I’d be happier with a solid background shipping with any distribution instead of this wallpaper. Again, I don’t doubt your talent, but the wallpaper is the first thing that goes when I load up a distribution. Could you breezify Clementine’s icon? To me, the project’s icon seems to have aged poorly. I’ve got a back-log of icons I’m trying to get in before the artwork freeze; I’ll try to do Clementine, but I don’t know if I can make it happen this release. The only complaint I have is the safari-like icon (guessing for konqueror or rekonq?). The icon is pretty, the complaint is that it looks like safari logo. Oh, I was looking at the Konquerer icon wondering what you were talking about – but it’s the Marble icon you were looking at. Huh. I hadn’t noticed that. I guess it’s between a rock and a hard place, because the marble icon is the same style of compass as safari, only tilted. Since Breeze uses forward-facing icons, it can’t be tilted anymore. It’s one of the icons awaiting feedback though, so we’ll figure it out. 100 years from now icon designers will be complaining about the monopoly of solar-system graphics being used for the intermind icons. Awesome, I can’t wait for these to be released! And I don’t think we had bad wallpapers as I can only see them improving on top of each other, which is what I see from this one, now welcomely breaking flat grids with a really nice effect! Very nice work both on icons and the wallpaper. 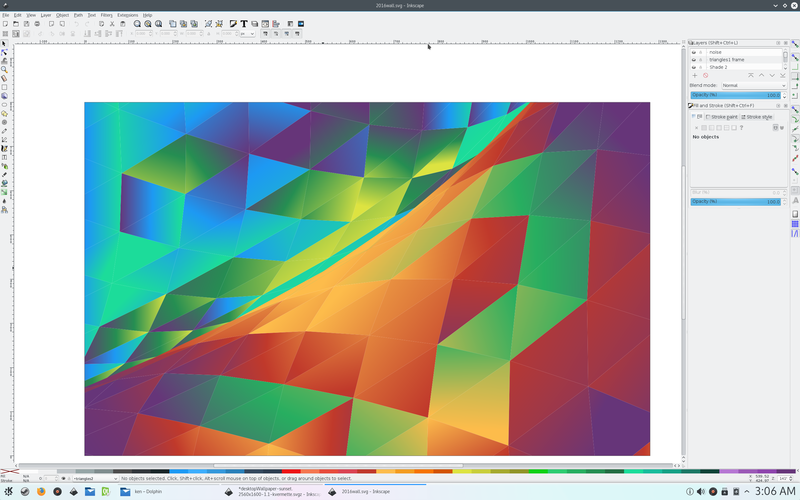 I appreciate it greatly – Plasma 5.x is starting to look more and more professional. Awesome! You have a great aesthetic taste. Awesome work! Previous Previous post: Google Deep Dream ruins food forever.